Bibi Ka Maqbara was built in 1660 by Aurangzeb's son, Azam Shah, as a loving tribute to his mother, Rabia-ul-Daurani alias Dilras Bano Begam. In 1756, Nizam-ul-Mulk Asif Jah, a distinguished General of Aurangzeb with the intention of founding his own dynasty in the Deccan, arrived at Aurangabad and made it his capital. He paid a visit to Delhi in 1723, but returned in 1824, Nizam Ali Khan Asaf Jah II transferred his capital from Aurangabad to Hyderabad in 1763. It was ceded by Ali Khan Asaf Jah II, Nizam of Hyderabad to Maratha Empire with Daulatabad and Solapur after Battle of Kharda in 1795 with paying indemnity of 30 million rupees. However, Marathi rule was lasted only 8 years and Nizam regained lost territories except Solapur with help of Arthur Wellesley, British general during Second Anglo-Maratha War. Aurangabad was a part of Nizam's princely Hyderabad State until its annexation into Indian Union and thereafter a part of Hyderabad state of India until 1956. In 1956 it became a part of newly formed bilingual Bombay state and in 1960 it became a part of Maharashtra state. Aurangabad Airport is an airport serving the city and has connecting flights to Hyderabad, Delhi, Udaipur, Mumbai, Jaipur, Pune, Nagpur. Recently flights were made available to the people travelling to the Hajj pilgrimage. Aurangabad (station code:AWB) is a station located on the Secunderabad-Manmad section of the Nanded Division of South Central Railway zone of the Indian Railways. Aurangabad has rail connectivity with Mumbai, Delhi, Hyderabad. It is also connected to Nanded, Parli, Nagpur, Nizamabad, Nasik, Pune, Kurnool, Renigunta, Erode, Madurai, Bhopal, Gwalior, Vadodra, Narsapur. But there is still a demand for direct rail connectivity to other major cities of India. The Aurangabad Jan Shatabdi Express is the fastest train connecting it with Mumbai. 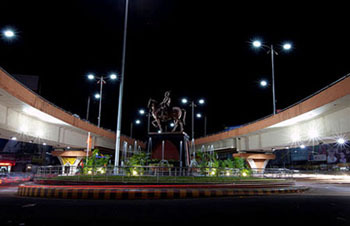 Aurangabad is well connected by roads with various major cities of Maharashtra and other states. National Highway 211 from Dhule to Solapur passes through the city. Aurangabad has road connectivity to Jalna, Pune, Ahmednagar, Nagpur, Beed, Mumbai and the route is currently being upgraded into four lane road of National Highway standard. A new Nagpur-Aurangabad-Mumbai express highway is also being developed. Bibi Ka Maqbara : Situated about 3 km (2 mi). from the city is Bibi Ka Maqbara, the burial place of Aurangzeb's wife, Rabia-ud-Durrani alias Dilras Banu Begum. It is an imitation of the Taj at Agra and due to its similar design, it is popularly known as the Mini Taj of the Deccan. The Maqbara stands in the middle of a spacious and formally planned Mughal garden with axial ponds, fountains, water channels, broad pathways and pavilions. Behind the mausoleum is located a small archaeological museum. Panchakki (water mill): Is a 17th century water mill situated at a distance of 1 km from the city. An intriguing water mill, the Panchakki is famous for its underground water channel, which traverses more than 8 km. to its source away in the mountains. The channel culminates in a mesmerising 'artificial' waterfall that powers the mill. The beauty of the mosque housed in the inner enclosure is enhanced by a series of 'dancing' water fountains. Gates in Aurangabad : One of the things that makes Aurangabad stand out from the several other medieval cities in India are its 52 'gates' each of which have a local history or had individuals linked with them. 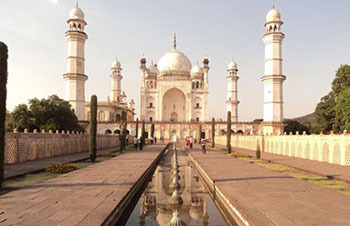 Not many people are aware of the fact that Aurangabad is also known as the 'City of Gates'. Aurangabad Caves : Situated at a distance of 5 km (3 mi), nestled amidst the hills are 12 Buddhist caves probably dating back to 3 A.D. Of particular interest are the Tantric influences evident in the iconography and architectural designs of the caves. One is also treated to a panoramic view of the city as well as the imposing Maqbara from this point. Quila-E-Ark : In 1692, Aurangzeb ordered a palace to be built and named it as the Killa Arrak. The space enclosed by the Killa Arrak or citadel covered nearly the whole ground between the Mecca and Delhi gates of the city. It had four or five gateways and a nagarkhana for the musicians. The walls were battle-mented and loop-holed and had semi-circular towers at the angles, on which guns were once mounted. The inner portion was occupied by recesses similar to those in the city walls. To the right of the entrance was a high terrace extending the whole length of the ground enclosed. Salim Ali Lake & Bird Sanctuary : Salim Ali Sarovar (lake) popularly known as Salim Ali Talab is located near Delhi Gate, opposite Himayat Bagh, Aurangabad. It is located in the northern part of the city. During the Mughal period it was known as Khiziri Talab. It has been renamed after the great ornithologist and naturalist Salim Ali. It also has a bird Sanctuary and a garden maintained by the Aurangabad Municipal Corporation. Shuli bhanjan is a nearing hill station with Datta temple.